I have been working with a friend on her kitchen over the past few months, and we are nearing the end of a multi-cabinet, drawer and closet overhaul. 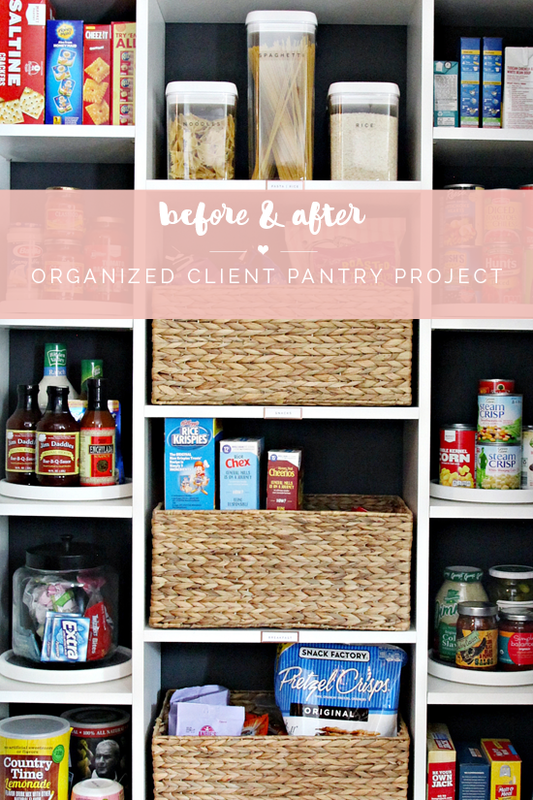 Installing and organizing a new pantry system was one of the biggest check boxes on our to-do list, and we are both thrilled with the end result. But let's back up for a second. 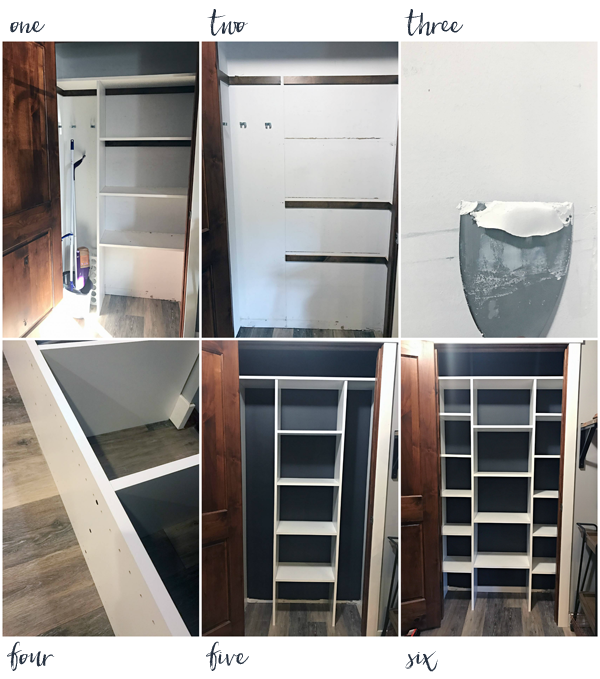 As I mentioned, this is part of an entire kitchen and mudroom organizational makeover, and we have been doing our best to design their highest traffic rooms into spaces that work hard for them (so they don't have to work hard to maintain them). I am working closely with this super sweet family of five who eat the majority of their meals at home 6-7 days of the week. Mom meal plans, but she also purchases quite a few items in bulk 1-2 times per month, with the exception of weekly produce and dairy. When I did my initial walk-through, the first thing that caught my attention was that they were storing food in a pantry closet as well as 3-4 miscellaneous cabinets throughout the kitchen. Here is a look at the pantry during my initial visit. 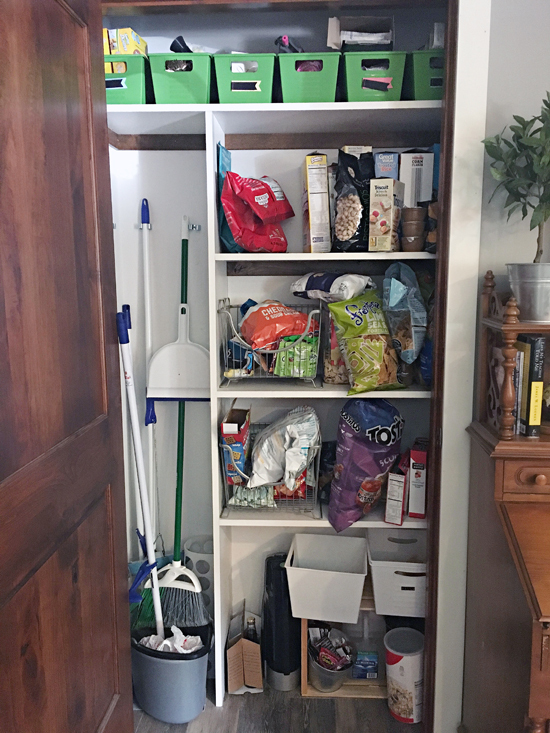 A system had been installed to make room for some cleaning tools, but there was very little flexibility and the closet definitely wasn't being utilized to its full potential. Our very first step was to empty every last cabinet and drawer in the kitchen and go through the sorting process. We paired things down, categorized, and put everything back in cabinets based on how the family uses the kitchen throughout the day. This was step one, and I asked for them to live with the ideas and changes for awhile before we got too wild and crazy with any storage purchases. 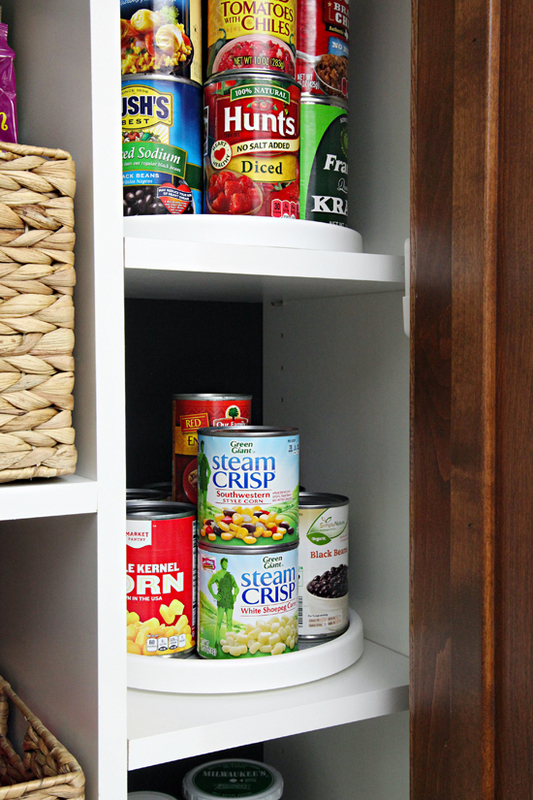 Being that I categorized all of their pantry/dry foods together, I recommended moving them all to the pantry closet. 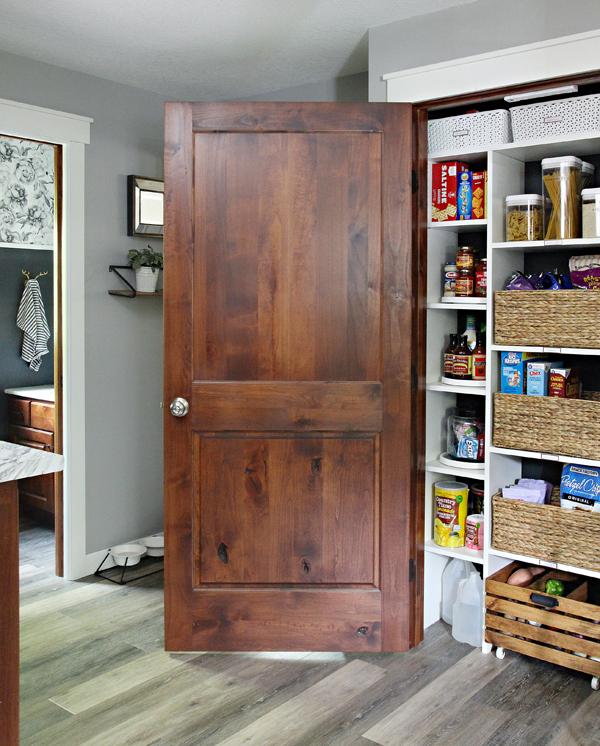 That would mean moving the cleaning tools to the adjoining mudroom and installing a pantry system that could offer flexibility combined with a plethora of fabulous food storage. I brainstormed quite a few options, but the goal was to give them floor to ceiling shelving with dividers to offer some sorting/compartmentalizing. I also wanted to give them flexibility paired with open and concealed storage. 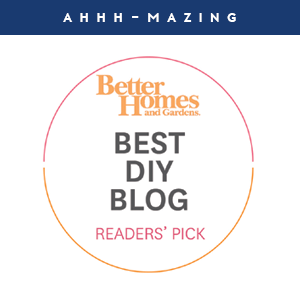 I considered everything from DIY systems to pre-designed high-end closet options. Ultimately, the DIY route won so we could create our exact vision and on a pretty reasonable budget. The entire closet is 43" wide and about 13" deep. The door is almost center, the right side has an inch or two of extra wall/trim more than the left. 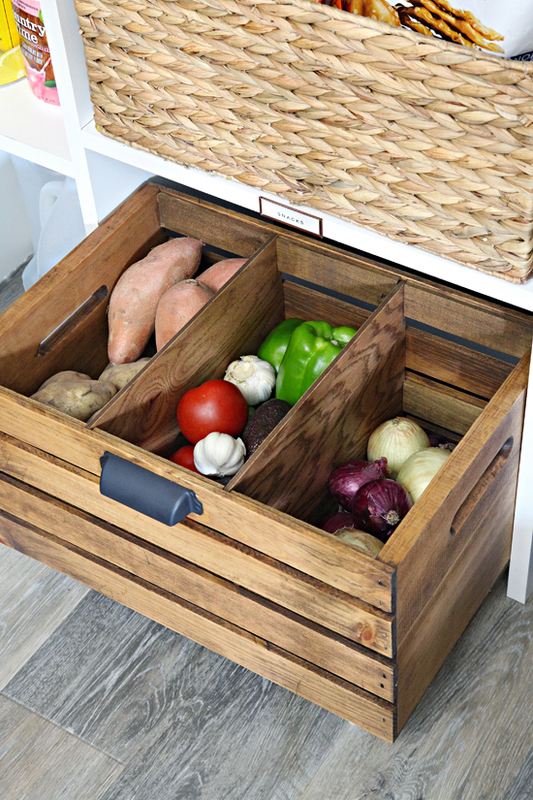 We had been sourcing a few food storage solutions online, and they already owned and utilized a wooden craft crate. The common width was 18" for both the crate and the woven baskets that we preferred. So it was set that the center of the closet would consist of 18" wide shelving, and the outer banks of shelves would be pegged to offer some height differentials. These smaller shelves would also be the ideal location for a few lazy susans, which are my number one way to make the most of an awkward nook. Above you can see the original plan we came up with for the product placement. This was based on their existing inventory, and also considered many of the reoccurring purchases that are made each week. I drew out the plan and presented it to their family receiving a thumbs up to move forward. Bryan and I removed the existing closet system and then scraped, patched and painted the walls. While the paint dried, we took a trip to our local Home Depot for the product. With the depth of the closet at 13", we were able to design the new system completely out of 12" melamine boards, a combination of both the pegged and smooth options. To assemble the unit, we cut the four vertical pegged boards to the height of 75". We screwed through the boards into each 18" wide shelf to create the center tower and plugged/concealed the screws with these. We measured a large box of cereal and spaced the center shelves accordingly. The pegged side of the vertical boards faced the outside of the tower, and the remaining two pegged boards were screwed into the side walls of the closet. Lastly, smaller boards were cut to size and were added to the system with these pegs and we trimmed the floor with base molding. Above you can see I painted the interior of the closet a stunning deep gray. I did this for a couple of reasons. First, I always love a painted closet because something so simple instantly amplifies the project by 1000%. Especially when you can use a bold color and pair it with simple white shelving. You can check out how I used poster board in her nearby cabinets for a similar effect. Secondly, the deep gray was leftover paint from adjoining rooms, including her darling half bath (which also adorns this floral wallpaper that I am lusting over). Now everything ties together beautifully and looks intentional and custom. 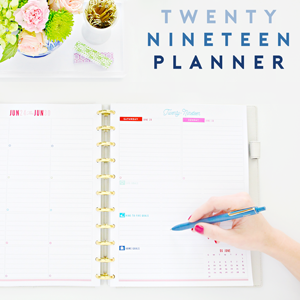 There is something so ridiculously satisfying about the process of creating a plan and watching your vision come to life. It's a shame this closet has a door because the end result is too good to be concealed away. A few favorite things in this project to point out. 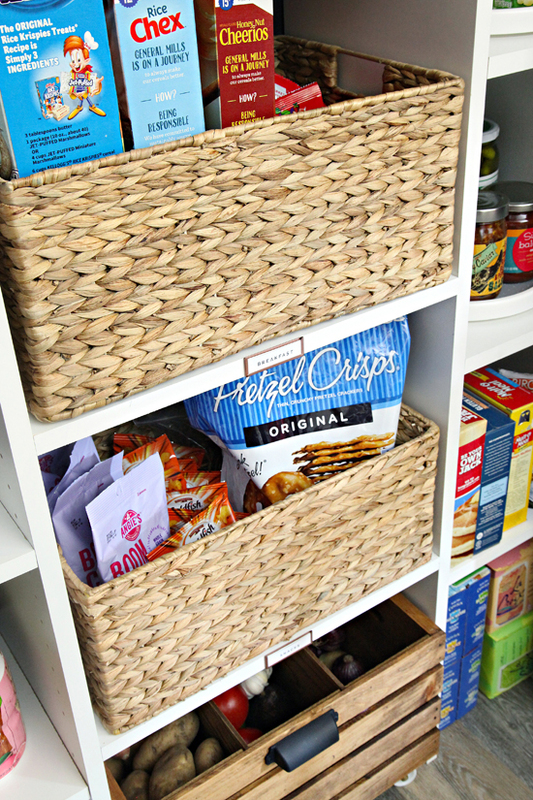 We planned ahead and made sure to measure every center cubby to fit bulk boxes and packaging, but also wanted to make sure to leave just enough room at the top to place a row of baskets to tuck away entertaining/party items. This includes paper napkins, banners, candles, etc.... Target has been selling the Y-Weave style basket for years and it sure is a popular choice and for good reason. They are versatile and pretty and lightweight and easy to clean. #supercrush And they truly conceal the assortment of items that live inside. 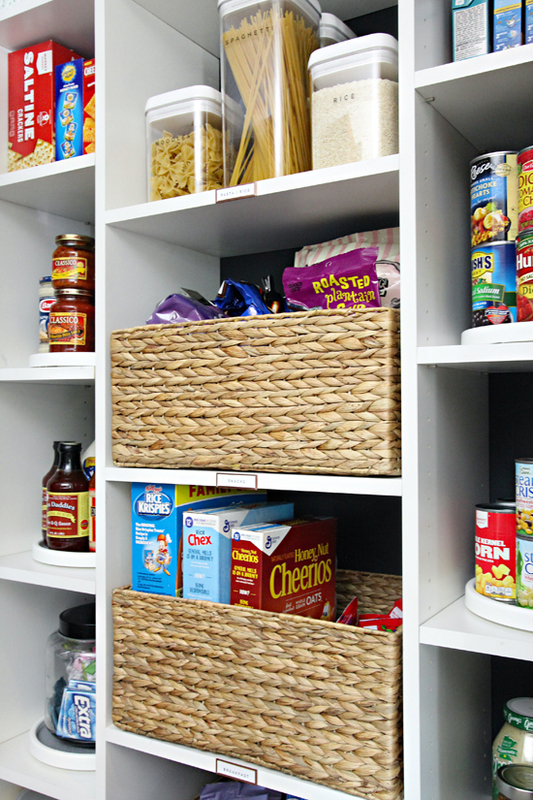 You will notice labels on the white baskets as well as down the center of the pantry. Another favorite of mine are these adhesive labels found at the Container Store. I pick up a couple of packs during every visit in fear they will someday stop selling them. For this project, I paired them with some copper spray paint to mesh with my client's style. The labels hold pretty well, but we did need to reinforce them on the white baskets with a small dab of hot glue due to the basket's texture. I am a long time fan of air-tight clear canisters in a pantry. They streamline things, give you a quick visual inventory and prolong freshness. In this situation, I provided two bins for spaghetti as they will purchase both regular and gluten-free noodles. Same story for the other pasta types. I am often asked about cooking instructions/details and those can always be taped to the back of the canister or under the lid if necessary. 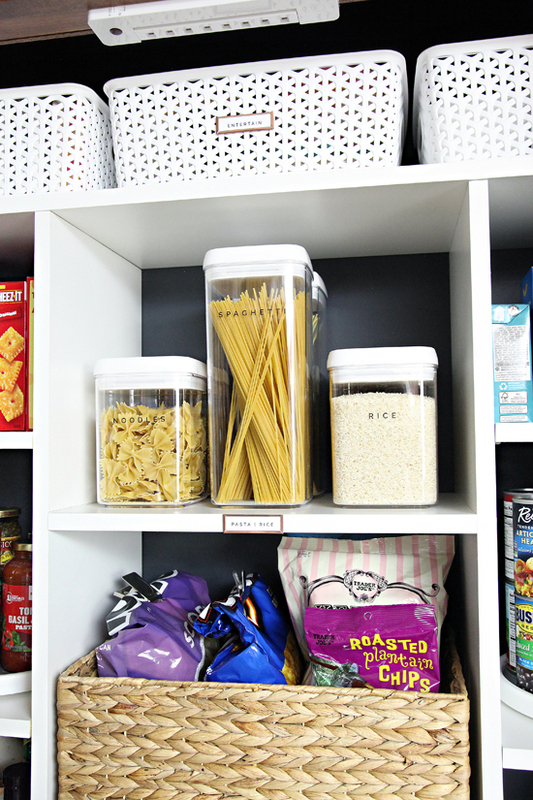 We decided that four regular pasta canisters and two spaghetti sized canisters would be a good fit for the pantry and their typical supply levels. I went on a wild goose chase looking for something fairly reasonably priced, that all matched and fit the available space on the shelving. Store after store I was coming up short finding matches and sizes until I found these online (this size for spaghetti and this size for all other boxed pasta). They checked all of the criteria boxes and I must say that they are pretty dreamy. I love the flip-lock lid and the sizes offered and that they could be mixed and matched vs. purchased as an entire set. I labeled the canisters with some leftover Waterslide Decal Paper, which is how I also labeled our own spice jars a couple of years ago. We contemplated adding some sort of drawer or pull out wire basket to the center column, but ultimately decided to just use woven baskets for a little additional space and flexibility. The shelves are only 12" deep so not much is lost in the back (which is always a win! ), but the baskets allow the contents to be pulled out and accessed easily. I added a few of these compartment organizers to provide a little extra division inside of the larger baskets. These organizers also fit nicely up in those white Target baskets as well! The corner shelves are perfect for smaller packages, boxes, cans, and jars, and you just can't go wrong with a good turntable. We added a total of six and they can hold anything from canned fruits and veggies to pasta jars, dressings, salsas, and soups. Nothing lost and everything always at their finger tips! I definitely need to add a few more of these to our own cupboards. We also wanted to get her produce corralled all together, as some types were living in the pantry and others were out on the counter and some were in a cupboard across the way. I have heard and read that storing onions near potatoes can cause them to go bad faster. That may be the case, but we have been storing ours in the same drawer for a few years now and we generally go through our veggies before they have time go bad. With some meal planning, it should be OK, but if you purchase veggies in bulk and want to prolong their life, you may want to store them in different locations. For this pantry, Bryan and I modified their existing wood crate to divide and hold all of the produce. I will share the full tutorial for the crate soon, but there is a liner at the bottom which can easily be removed and cleaned, and the casters allow the crate to roll out like a smooth drawer. The floor worked out for also storing other bulk items such as water, boxes of sports drinks and juice. Last but not least, we found a remote light that we were able to add just inside the pantry door to be sure it never gets too dark when looking for goodies. The remote is tucked just inside the door like a light switch. So what does the family think? They are all loving having everything in one easy-to-see-and-find place and it has already made a big difference in how they plan and shop for their meals. And better yet, it freed up a lot of other cabinets in the remainder of the kitchen and allowed us to better utilize the kitchen as a whole. I can't wait to finish up a few more of those areas and share the rest of the story with you soon. As tradition goes, no good before and after makeover would be the same without a final side-by-side view of the changes. I will be back soon to share more details for the DIY divided rolling crate! Happy organizing friends! Wow! I can't even begin to tell you how much my OCD brain loves this! OH boy...that is dreamy! I want a tour of the whole house please ;). Love her style!! Love this kind of transformation! Please, keep'em coming :-) I think it would also be great to have a post that recaps the whole concept (how you tackled the kitchen as a whole, deciding what to move where, how to use the space best etc). Great design and space usage! Luv your ideas! Please come to my house next! :) We just moved, so figuring out the new kitchen is still in the trial-and-error process. I have the cupboards pretty well laid out, but the pantry storage is off in the laundry room, and is a confusing mess right now. Definitely going to take some of these ideas, especially the crate on casters. Thanks! Can't even begin to describe how happy I was to see this! I'm planning on giving my kitchen a mini update this weekend (happy 4th?) 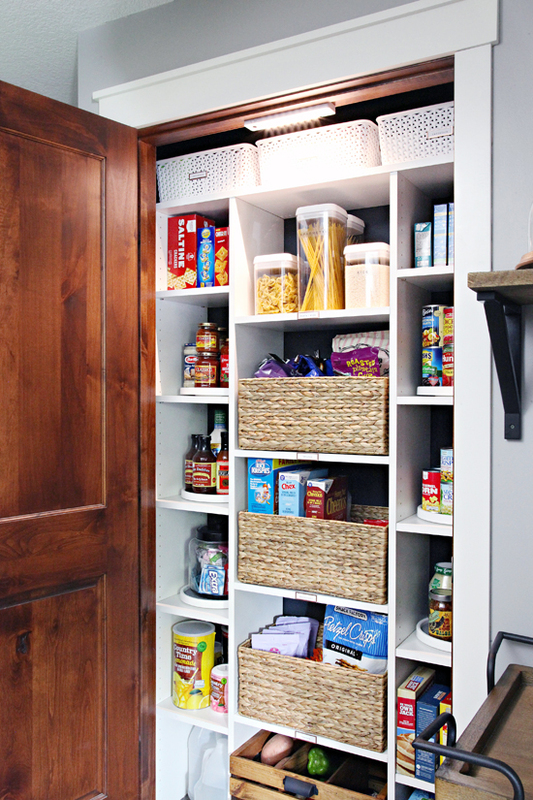 which includes organizing the pantry. We have a fairly large pantry and it's just totally trashed. I'm embarrassed anytime I have to open it when guests are over. This is giving me so many good ideas, especially the turn tables! Never would have thought of that. I'm so excited to empty everything out and start fresh. I love it! What a great vision to make that space more functional. Now my brain is turning about how to improve my own space. This is fantastic! 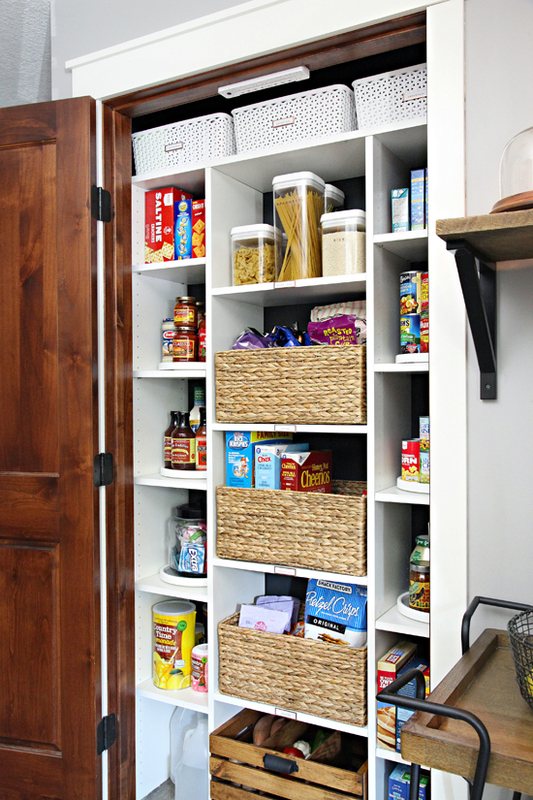 We don't have an actual pantry in our house, but this makes me want to turn a little nook we do have into one. Especially because all those bags of chips and crackers are such an eyesore on the kitchen counter :( Much like your client's before picture. I love this transformation! The only thing that was a turn-off for my lazy-food-grabbing-self is the cereal boxes inside that woven bin. I would hate to have to pull it out/balance it on the shelf and maneuver the tall boxes out! I wonder if anyone else is like me? Overall, I think you did a great job and this family is so lucky to be working with you! This is dreamy 😍 Great work! You've inspired me to tackle my deep, narrow, tall "pantry" cabinet. Any tips for organizing something like that? Thank you Sarah! 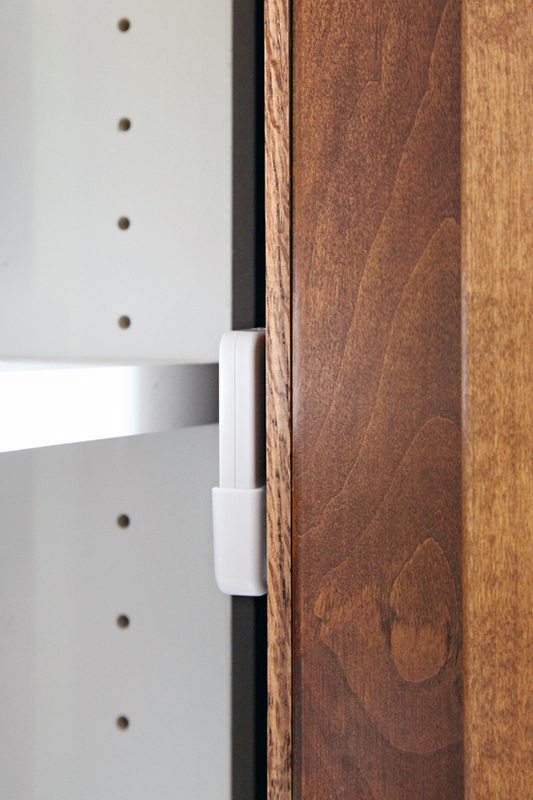 When it comes to cabinets with depth, it is important to find ways to access the items in the back of the cabinet. The best solution is to install pull out drawers/shelves. If that is not an option, consider using lightweight bins or baskets to serve a similar function. 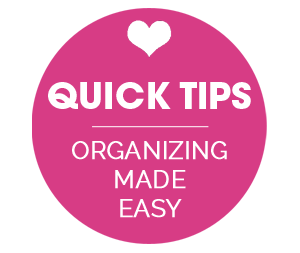 Turntables and tiered organizers are also helpful. Lastly, don't forget about the back of the door. 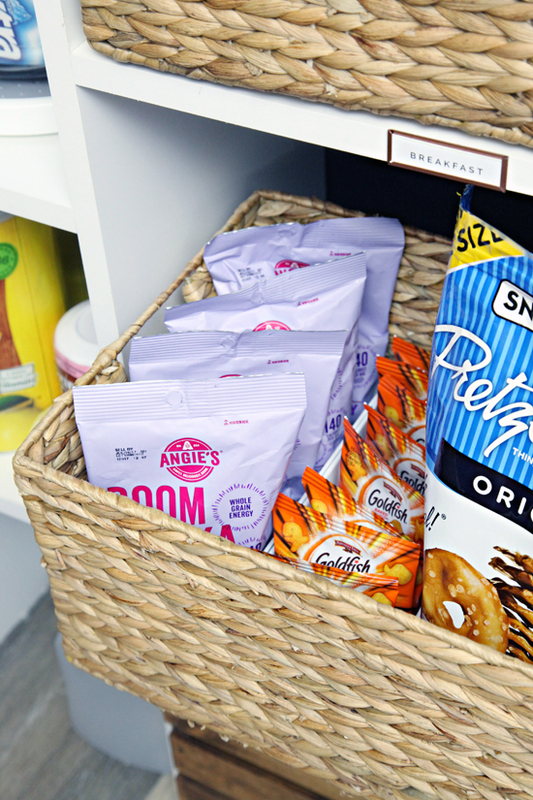 It might be a great place to add some bins with command strips that can hold small snacks and packets. 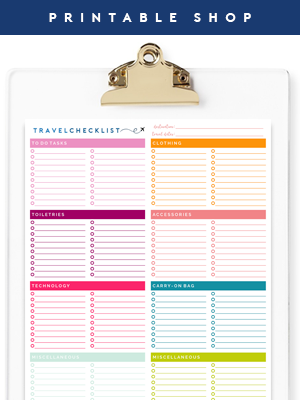 Or even just a clipboard to display your shopping list and weekly meal plan. Good luck, you got this! It's a great transformation. I cleaned out our pantry recently and got rid of a lot of stuff. It is wire shelving which has its pros and cons. I really like your light idea for the closet which I am going to use for my large craft closet which has no light...ugh. Thanks! Where did you put the bulk storage? We buy large quantities from Costco (say a large olive oil bottle or the multi-boxes of Cheerios). Do they have a separate storage area for those items? Much of her bulk is stored right here in the pantry (extra dressings, sauces, larger bags of chips/snacks, juices...), however, she also stores it in her fridge and separate freezer. We were also able to free up her corner cabinet/lazy susan area for any additional overflow items. 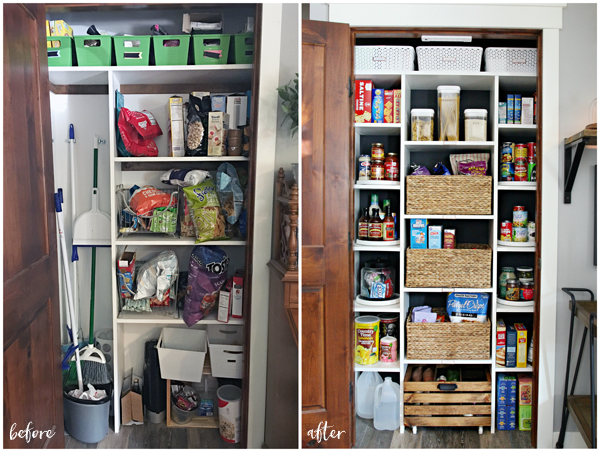 :) We planned the pantry around the type of bulk product that she typically purchases, and luckily she has some wiggle room with the adjustable side shelves as well. This is super helpful, thanks! 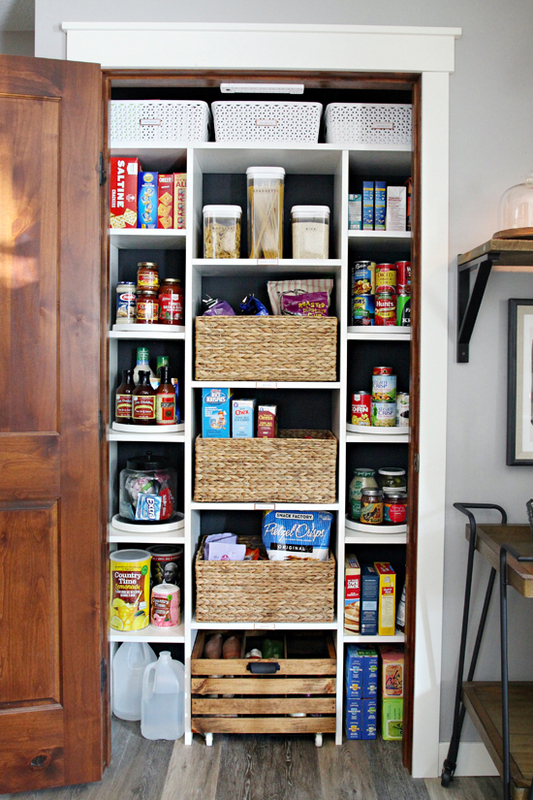 I have a super deep pantry too. I wish I could renovate it to make it more efficient since it's big enough to be a walk-in if it wasn't three stacked super-deep-and-super-tall cabinets, but I'm in a rental. :/ I'll be sure to implement these tips! Where did the broom and cleaning supplies go? I have no place for them, except in my pantry and it is a source of much frustration for me. The broom is always falling on my head! Right now they were moved to another closet until we can incorporate them into her mudroom which is the next space we are tackling. :) How are you hanging your tools? I highly recommend using the spring/grip clips to prevent any movement when the door is opened/closed or when things are placed in and out of the closet. (something like these: http://www.homedepot.com/p/Everbilt-7-8-in-White-Spring-Grip-18028/202305505). That looks amazing! Love the baskets and crate! Do you have any recommendations for hanging brooms and such on a wall and not concealed? We have no option but to hang our brooms and bona mop on the wall in our kitchen. The only stuff I could find is really ugly (although practical) like you would use in a garage or storage/utility closet - out of sight. I am always on the hunt for something more pleasing to the eye since it already stinks that we have to look at our broom and mop! Ha! Thanks! Hi Jaime! 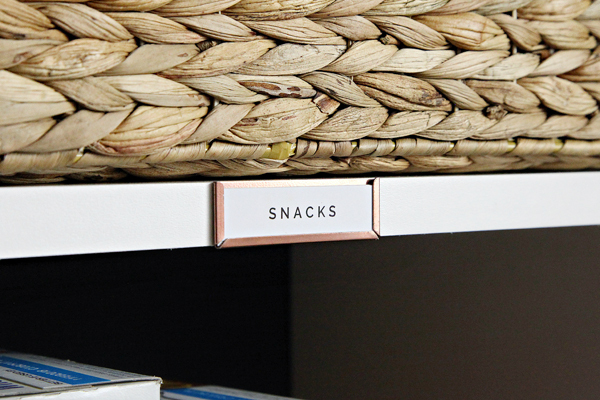 If I were in the same boat, I would probably do a rail of decorative hooks (think something from Anthropologie or a DIY version of inspiration found there), or even just a pretty strip of wood with dowels (similar to this image: https://s-media-cache-ak0.pinimg.com/originals/6f/1d/fe/6f1dfe51280030c03146d3154d39da91.jpg). 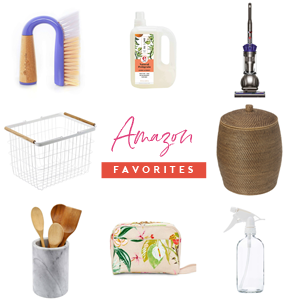 I actually think if the right tools are hung there, it could look really chic and intentional (I absolutely love many of the wooden tools found at HomeGoods or by the Full Circle brand: http://bit.ly/2tuEFpn). I love the remote light idea! I can't tell for sure how it works? Is it still a turn-on-by-hand or does it switch automatically with the door opening/closing? Thanks! Hi Hannah! The light still requires them to turn it on by pressing the button on the remote mounted just inside of the door (similar to flipping a light switch). There are options on the market that do automatically turn on when the door is opened, but I believe those require hardwiring which we opted to skip for this particular project. That is inspiring. I wanted to let you know the container store link for the adhesive labels isn't correct. It takes you to the Target baskets. WHat paint color did you use behind the shelves? Looks awesome contrasting against the white!! Love the use of decal paper. 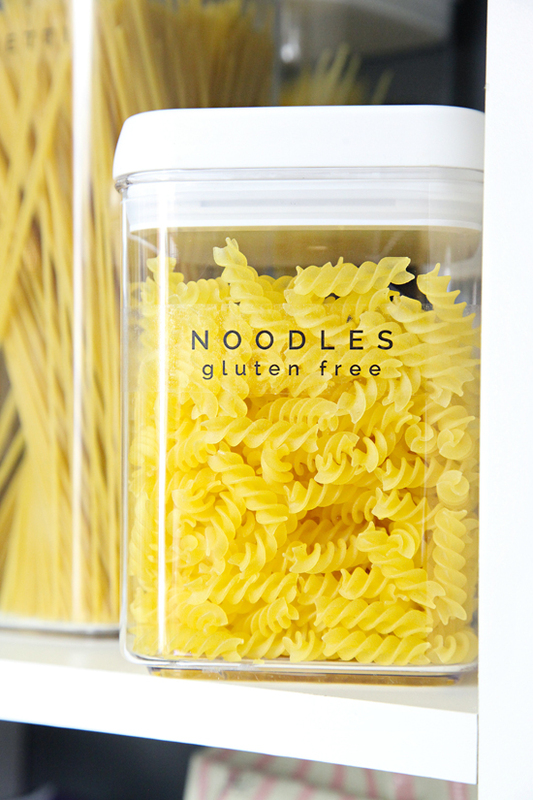 Can you tell me what font you used for labelling the pasta containers? Thank you! The font is called Raleway.